Apple Pay did extremely well in the December quarter, Apple CEO Tim Cook revealed this week, growing transactions 500 percent year-over-year thanks in part to the platform now being in over a dozen markets worldwide. The number of users has tripled during the past year, Cook revealed during his company's quarterly earnings results call Tuesday evening. Beyond the U.S., Apple Pay is now available in Australia, Canada, China/Hong Kong, France, Japan, New Zealand, Russia, Singapore, Spain, and Switzerland. In the call Apple also noted that over 2 million small businesses are now accepting invoice payments via Apple Pay on the Web, and that the "Services" segment to which Apple Pay belongs saw revenue hit $7.17 billion," up 18 percent year-over-year. That category also includes major drivers like Apple Music and the iOS App Store. U.S. internet and TV giant Comcast will start accepting Web-based Apple Pay for bills later in the March quarter, Apple said. Web support for Apple Pay first rolled out in September alongside iOS 10 and macOS Sierra, and within two months had already reached over 1,000 sites. Unlike physical stores, web support is relatively easy to implement, especially since popular backends like Stripe and Shopify integrate it. In total Apple pulled in $78.4 billion during the December quarter, fueled mostly by sales of 78.3 million iPhones. Mac sales were up to 5.4 million, but iPads sank 19 percent to about 13 million. Way to go Apple! This is really awesome. Apple's global efforts are paying off. We love Apple Pay and use it whenever we can. Case in point is Exxon/Mobil's support of it. Though I've experienced recently some hiccups in its system, their Speedpass+ apps does work fairly well. Love using ApplePay and continue to be disappointed in the sluggish adoption rate among US retailers. I honestly cannot figure out what many of these laggards are thinking. It's a fail I tell you! Yesterday, I needed to pay my nephew to wash my car; just a little pocket money to supplement what he gets for his paper round. But no matter how many times I tapped my phone against his head, the payment wouldn't go through! I swear to god, if Apple doesn't sort out these BASIC problems AND give me a Mac with an infinite number of internal slots then they are doomed I tell you! DOOMED! And on a related note, happy birthday to my nephew who is thirty-eight today. I love apple pay with my watch. Anybody know how much of a cut apple keeps from each transaction? They keep a small portion of the interchange fee. It's said to be .015% (and I have a page from one ot the contacts filed somewhere that shows that rate) but Apple themselves have not confirmed that AFAIK. There's also some other misc fees they might be getting along with a plethora of data (not personal), but they're certainly not getting rich from it. Still it's a very valuable finger into the larger economy as a whole. In at least the US tho even that small percentage may well go away once the initial banking contracts expire, reportedly beginning about three years from now. Apple is no longer needed as the middle-man under the current industry standard as there's nothing their unique services are needed for, and in fact sharing the interchange fee will no longer permitted under their rules. The banks/Visa/Mastercard made sure of that. That's why most of the other mobile payment providers aren't getting even that tiny cut. Europe is a different cat which might explain the slow roll of Apple Pay there as there's rules proposed, if not already in place, capping the interchange fees at such a low rate that it's highly unlikely anywhere close to .015% is shared with them. 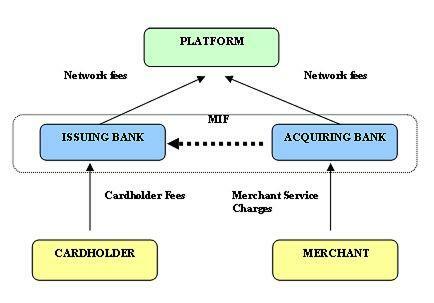 For those confused about where payments to Apple are coming from it's from the Visa/Mastercard network itself, "network fees" and not any individual merchant. The unusual agreement does give Apple access to much of the underlying transaction data tho via Visa/Mastercard. Apple was able to wrangle quite an agreement with the assistance of the payment networks. EDIT: I forgot to mention that that they are also (presumably) getting a half-cent for each debit transaction that goes thru Apple Pay and perhaps some other Visa/Mastercard incentives. I agree -- ApplePay plus Watch is a great experience. Allegedly Apple gets 0.15% of the value of a transaction. Note, that's not 15% or 1.5% -- it's 0.15%. Also, the merchant doesn't pay extra for ApplePay. The credit card company shares part of their fee with Apple. Why do they do that? Primarily because the security of ApplePay reduces fraud and therefore saves the credit card companies money. .015% or 15 cents from a $100.00 transaction. And remember, it comes from the banks' share--the merchant and the customer pay nothing extra. With the decreased fraud, the tiny amount the banks pay to Apple is likely more than made up. That's why there has been such broad adopting of it by banks in the US. The pace of merchant adoption has been much slower both because many places are still upgrading their machines, but also because larger companies, e.g., Walmart, Home Depot, etc., also fear losing that customer data and control of the consumer relationship. When you use Apple Pay, the store doesn't get any of your information, only your bank knows where and what you bought, that's why when Target gets hacked, your data doesn't get stolen, yeah!! I def agree using Apple Pay on the Apple watch makes it so easy. But using it on apps that supports it is where it really shines. No need to give them your cc number and shipping, billing and contact info is all done for you. No Apple gets a cut due to excellent timing, influence/reach, and simply because they initially assisted with the secure processing since there was no standard yet agreed on when Apple Pay first rolled out. AFAIK there's nothing peculiar to Apple that is still needed for secure mobile payments. Now online stuff I'm not familiar with so that might be different. Thanks for the info. Why is it when analyst chastise apple for not innovating they never consider apple pay. -Over 30 different categories of data, reporting on things like "number and dollar volume of credit and debit activity, average ticket, breakdown of transactions between in-store and in-app usage, top 100 merchants by charge volume", and many others. Duane Reade, the New York unit of drug-store giant Walgreens Boots Alliance Inc., led the brick-and-mortar merchants with Apple Pay capturing 1.8% of card purchases. Next was Whole Foods at 1.69%. Canteen Vending took third place at 0.98%. Both Duane Reade and Austin, Texas-based Whole Foods were Apple Pay launch partners and have promoted the service, says Wolf. The POS merchants where Apple Pay usage is highest are “without exception” establishments such as grocery stores, restaurants, and coffee shops that consumers could visit daily or weekly, he says. Among the e-commerce-only Apple Pay acceptors, Boxed Wholesale, an online competitor to warehouse stores such as Costco, led the pack with Apple Pay taking 1.99% of card transactions. In second place was gift-card exchange Raise at 1.7%. "Also, the merchant doesn't pay extra for ApplePay. The credit card company shares part of their fee with Apple. Why do they do that? Primarily because the security of ApplePay reduces fraud and therefore saves the credit card companies money." This is a clever deal. Truly a win-win situation. STEP 1: Get a damn iPhone. But in all seriousness, this is such a convenience, fast, and secure system (that now extends to Android Pay, Samsung Pay and others that I'm really surprised the banks themselves aren't pushing this by allowing retailers that 1) advertise it, and 2) use it to get discounts on their charges since the chance for reembursing a stolen purchase becomes infinitesimally small. Chip cards help, but they only stop the old-time card skimmers, not those that have possession of your card. Which is why I don't understand why they don't charge the merchant a little less for using one of the secure NFC-based payment systems, like Apple Pay. .015% or 15 cents from a $100.00 transaction. Is that correct? For a $100 purchase, 15% would be $15, so 0.015% would be $1.50, and 0.0015% would be $0.15 or 15¢. Right? All I can say is that it varies between countries. Apple gets a cut of the interchange fee, what some are calling the transaction fee, not the transaction itself. I think the OP was confused by the terms. The payments industry is their own little not-consumer-friendly anti-competitive fiefdom. We aren't supposed to understand it because if we did antitrust lawsuits might follow behind.